The 25th part in the GINZA×CSR series introduces TBM, a startup company that was established in August 2011 and moved its offices to Ginza in November 2016. TMB develops, manufactures, and sells an innovative new material called Limex, which is primarily made from limestone and is meant to replace both paper and plastics. TMB is being applauded for its pioneering work in creating a sustainable future. In this segment, we speak with TMB president Nobuyuki Yamazaki. ─Limex is an innovative new material made from limestone as a substitute for paper and plastic, and it is rapidly making headlines for its economical and eco-friendly properties. 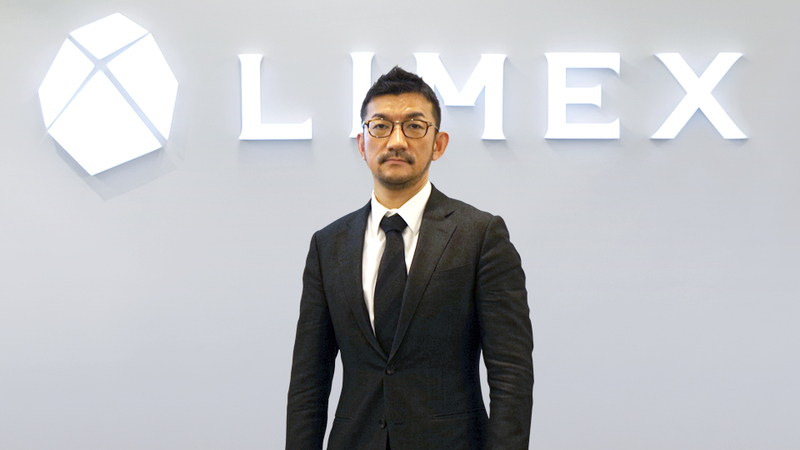 Tell us how Limex got started. It all started back when people were first starting to become environmentally conscious. Bringing your own chopsticks to restaurants to cut back on disposable chopstick use had become a big thing in Japan. I heard that a Taiwanese outfit was making something it called “stone paper” from limestone, so I decided to set up a company to import their product. When we actually tried to sell it, however, we found that the significant environmental benefits just didn’t outweigh the high cost for people. It just ended up being a niche novelty item. However, numerous people told us that we would have a really great product if we could just get the cost down, make it lightweight, and ensure reliable quality. I felt like it still had potential. So I brought on a former senior managing director at Nippon Paper Industries as our chief advisor. We asked our Taiwanese suppliers to improve their quality, but when it didn’t work out the way we had hoped, we decided to take technical development into our own hands. ─What do you think the global impact will be if Limex catches on? They say it typically takes about a hundred tons of water and around twenty trees to make one ton of standard paper. We don’t tend to think too much about water resources living in Japan, but I was shocked when I found out just how severe the water shortages are in developing countries who are experiencing a population boom alongside advancing industrialization. They also say we only have about fifty years before we deplete our petroleum resources. That made me really want to take a chance on Limex. It’s made primarily of limestone, which exists all over the world. You can even get it in Japan. Right now, I’m looking to expand to the Middle East, Africa, China, India, and so on. Because Limex is a water-resistant material that can be used in place of paper and plastic, we want to develop the technology to meet a variety of different demands—to expand its potential. It’s made with zero water and zero trees. Limex business cards. One box saves about 10 liters of water. ─You built a pilot plant in Shiroishi, Miyagi Prefecture in February 2015. You were recognized for your active contribution to business development in an area that was devastated by the Great East Japan Earthquake, earning numerous awards, among them the Great East Japan Earthquake Reconstruction Award at the 2016 Japan Venture Awards. What makes you so passionate about making a difference in the world—on top of your passion for advanced technology? I grew up in Kishiwada, Osaka, and was twenty-one when the area got hit by the Great Hanshin Earthquake. I wanted so badly to help, but at the time, there was nothing I can do. The experience stuck with me, and I wanted to make sure I became the kind of businessman who would give back if a similar situation happened in the future. TBM was in a tight spot right after the earthquake, since we had just established the company. But we decided to build our plant in Miyagi Prefecture, in part because we wanted to contribute to the recovery effort. It was as if the recovery support that we thought would come through our business activities once the company had grown ended up being part of the company growth process itself. ─In July 2016, you set up your first overseas subsidiary in San Francisco. What are your goals with this new venture? Silicon Valley is the global leader in startup companies. The electric car manufacturer Tesla is there, and there are lots of people in California who are willing to back Tesla in its challenge knowing that the company is working to create social sustainability on a global scale. And they’re willing to support the cars even if they have problems—because they want to give Tesla feedback on how the cars drive and help them to get even better products out into the wider market. California is also suffering from water shortages, and there are a lot of very environmentally conscious people. Getting them to use your product carries a lot of weight with the wider world, and I think it will have an impact on the Japanese market as well. ─You’re also advancing diversity initiatives at your company, including installing barrier-free speakers. With that, we’re looking to make it easier for our chairman and other senior business leaders, men who played a huge role in Japan’s manufacturing-driven economic miracle, to hear. We also did it as a way to invest in environmental, social, and governance (ESG) concerns. The real beauty of this whole thing is challenging the world by creating new materials with these highly experienced men. ─You started operating out of the Ginza headquarters in November 2016. What’s behind that decision? People of all ages come to Ginza from all over the world—from the elderly to kids to lovers—with a sense of exaltation. The area has a really positive vibe. I tend to work no matter what day it is, and when I work on the weekends, Ginza becomes a pedestrian paradise. Just looking at the smiling faces of the people walking around gives me fresh ideas and inspiration. It feels like having your finger on the pulse of the world here. It’s a place that attracts attention and has ability to deliver a message to the world. I think it gives us an edge in terms of marketing. Ginza has a charm about it that’s unlike any other city in the world. ─Where are you taking your company next? I want Limex to be used during the Tokyo 2020 Olympic and Paralympic Games, so the people who come in from all over the world will get to take it home with them and spread it across the globe that way. Two businessmen I admire are Elon Musk at Tesla and Masayoshi Son at SoftBank, because they don’t just think about business in terms of their own lifetimes. They’re constantly taking huge risks with the idea that they’re working for the happiness of the people that live a hundred or two hundred years from now. No matter how many new technologies we develop, it all comes back to people. I want our company to maintain its clear vision and focus as it connects with more and more people who will serve as leaders in the decades to come. Yamasaki has started up many businesses, beginning with the launch of own used-car business while still in his 20s. In his 30s, he became committed to creating a billion-yen, globally competitive company that would still be bringing joy to people’s lives a century from now. He established TBM Co., Ltd to act as this kind of gateway to the future, and the company received the Great East Japan Earthquake Reconstruction Award at the 2016 Japan Venture Awards. The US accelerator Plug and Play also selected TBM for its Social Impact Award for Companies Achieving the Biggest Global Social Impact. TBM also appeared on the 500th anniversary program of the TV Tokyo series Nikkei Special: Cambria Kyuden.